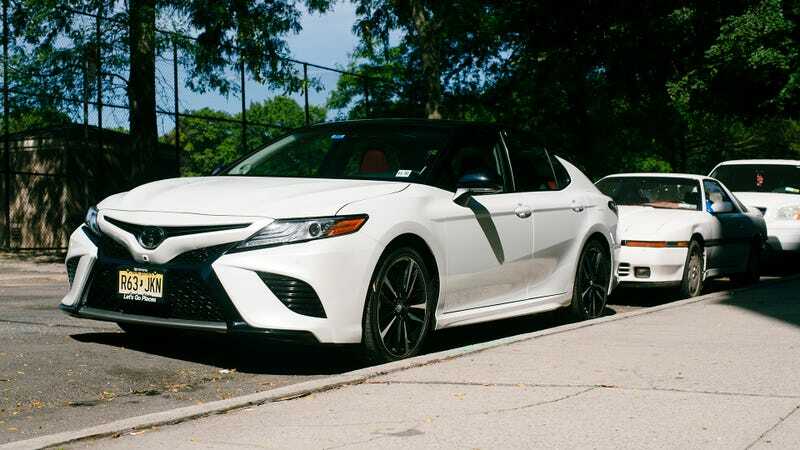 It is 2018 and you can walk into a Toyota dealership and put down about 40 grand to get a two-tone black over white Toyota Camry with 300 horsepower, an eight-speed automatic and a red leather interior. What is happening! Here’s a Camry press car I’ll be driving the next few days. To be completely technically correct, this Camry has 301 HP, as well as 267 lb-ft of torque from its 2GR-FKS 3.5-liter V6. This thing has both direct and port injection, it’s all-aluminum and for some reason it always makes me think of the 2GR that runs in D1GP in Matsukawa’s AE85 Corolla. His is turbocharged to a good 712 horsepower, so that’s a little different, but hey, 301 is plenty for the interstate, right? Toyota hasn’t sent me a full spec sheet of this thing, but I quickly did a rough calculation on Toyota’s website and came out to $38,500 before you get to accessories like special floor mats or ‘Camry’ embossed into your door sills, which you can get illuminated as well as with side skirt things. This rang up my ideal version of this car to $39,997 with a $920 delivery fee, though this exact car as I have it stickers at $38,750 including $895 delivery fee. I’ll be road tripping this thing this weekend, trying to see if 301 horsepower is fun even if it’s strapped into the most purposefully straightforward family car imaginable. But that’s my plan. What do you want to know about it?